I have come to realize that in Japan, there is more to temperature than environment. In the U.S. we tend to flock to pools or air conditioned zones to get away from the oppressive summer temperatures in some areas, such as my current summertime location in Washington D.C. But in Japan, it can be quite different. In a big city such as Tokyo, the heat can be crippling when combined with the extreme humidity. However, the worst problem is that people are out in it. There’s no such thing as going from the air conditioned house to the air conditioned car to the air conditioned office. Public transport is the most common way to work, and people have to get there somehow – most often by walking – and then walking from train to work. In addition, this particular summer, with the electricity crisis happening all over Japan and the government looking to reduce usage, the trains are even warmer than in past summers. The most common sight in Japan is the little towel. People all over pull it out of pockets and mop up sweat on their faces and brow. It’s one way to grin and bear it. The perfect gift for a summer resident of Japan is this towel. My husband sometimes carries two of them. There are such things as cooling foods, almost guaranteed to lower the internal body temperature. 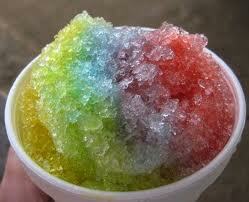 One such food is the ever-popular shaved ice. It’s a staple of the Japanese Matsuri (festival) and can be found in shops throughout the cities in the hot months. The Japanese people do not like things as sweet as Americans do, so there’s most often more ice than syrup in the Japanese version, which is even cooler. Smoothies, ice cream, gazpacho soup – they’re all foods that cool internally. When I am in Japan in the summer, I have observed skyrocketing sales of ice cream. The Japanese believe that it cools one’s temperature significantly and don’t mind the indulgence. Of course their portions are significantly lower than an American’s idea of an ice cream cone. The Japanese people drink less plain water than Americans, also. They believe in the cooling power of tea – green, black or barley. I don’t think jasmine tea is as popular for a cooling function, but it is available. Beyond food, sometimes “cool” really is a state of mind. The Japanese government, for the first time, is approving Hawaiian shirts as proper office attire in this summer of SUPER cool biz. To me, this is a recognition of the power of mind over matter. When wearing one of these lightweight, cotton shirts, one can’t help but think of palm trees, cool breezes, and delightful beaches. The Japanese are a stoic people who have a strong sense of national pride and want to do the best they can to help their country. Most of the expats who reside there feel the same. And if helping the country involves wearing a printed, cotton shirt to work, then let’s all go purchase a few. These are a few ideas to beat the summertime heat in Japan. When all else fails, please do head for the beach or the pool or even the aircon. In the meantime, mop your face, drink heartily and think cooling thoughts. Good luck!